In December of 2005, I went to the hematologist for my routine blood test. I told her how awful I was feeling. There were times I was so cold my teeth would chatter. I constantly heard a pounding in my ears or what sounded like a swarm of locusts. I walked my dogs in the backyard when I got home from work each day and I could barely stand up without holding onto the fence or a tree. She told me exactly why I was feeling so poorly. Remember I mentioned in a previous blog that the hemoglobin count doctors like to see is 12. Well… mine was now down to 3. She told me that a couple more days and my heart and kidneys would have failed. She admitted me to the hospital that very minute. My son, who had driven me to my appointment, was in the waiting room. She asked one of the office staff to bring him to her office and told him I was being admitted. I insisted on going home to pack a bag first but my doctor wouldn’t hear of it because of the seriousness of my condition. The next thing I knew I was lying in a hospital bed and receiving a 6-pint blood transfusion. That’s more than half the blood in your body. This may sound stupid but I wondered if they would have to drain 6 pints of blood out of me before putting the new blood into me. The answer was no. The new blood would just be absorbed into my body. By the next morning I was sitting up in bed and feeling much, much better. Receiving 6 pints of iron rich blood did the trick. I was anxious to go home. I had a big smile on my face when my hematologist came in to check on me. I told her I was feeling good and ready to go home. She told me I would be staying the week so I could rest and undergo some testing. WHAT? It was the week between Christmas and New Year’s. I was hosting a New Year’s Eve party at my house. My hematologist wanted my GI doctor to perform an endoscopy and a colonoscopy to see if he could find anything. I had lost so much iron. It had to be going somewhere. However, his tests showed nothing. I was released at the end of the week and hosted my party after all. Happy New Year! 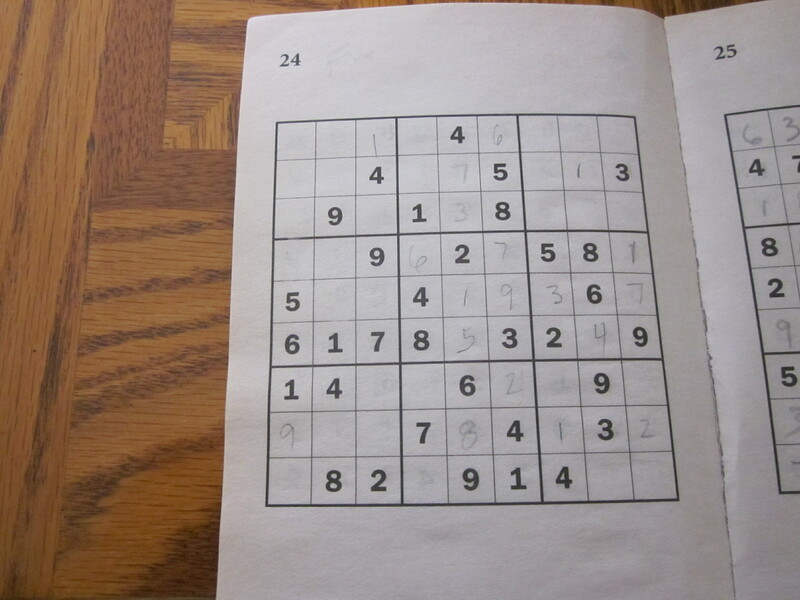 I don’t know if I mentioned that I love to do Sodoku puzzles. Actually, my son started doing them years ago and got me hooked. 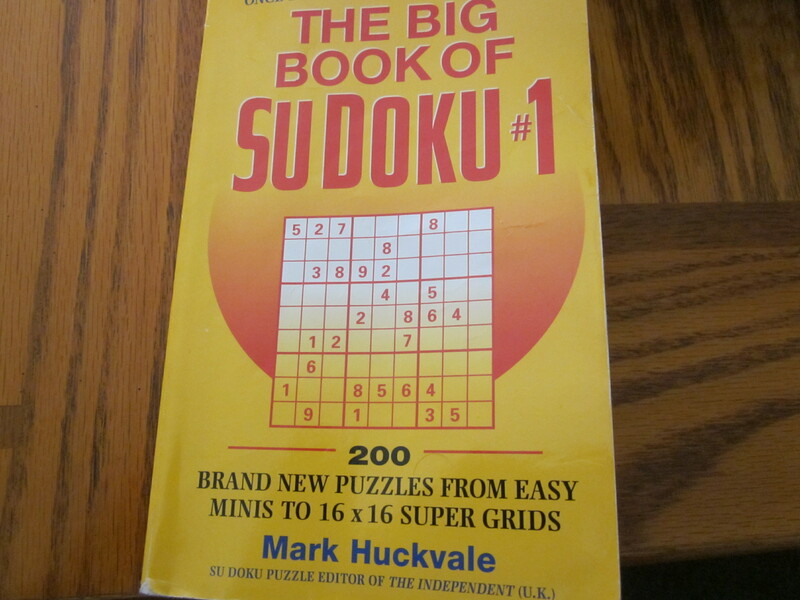 I found his book of puzzles recently and did a few. I saw him a couple of weeks ago and handed him his Sodoku book back. He wouldn’t take it and told me I could keep it. I asked him why and he said because he was working on puzzle #24 in the waiting room the day he drove me to the hospital and was summoned into my doctor’s office. He never finished that puzzle. I flipped to it and sure enough it’s only half finished. He never wants to see that book again because it brings back bad memories. I’m so happy I’m alive and able to do Sodoku puzzles. I try to do one a couple of times a week and will do so until the book is finished. Then I guess I’ll throw the book away, but not before I rip out the page with puzzle #24 on it. That… I just may save. So last Sunday I was hungry for a snack. A sweet snack. 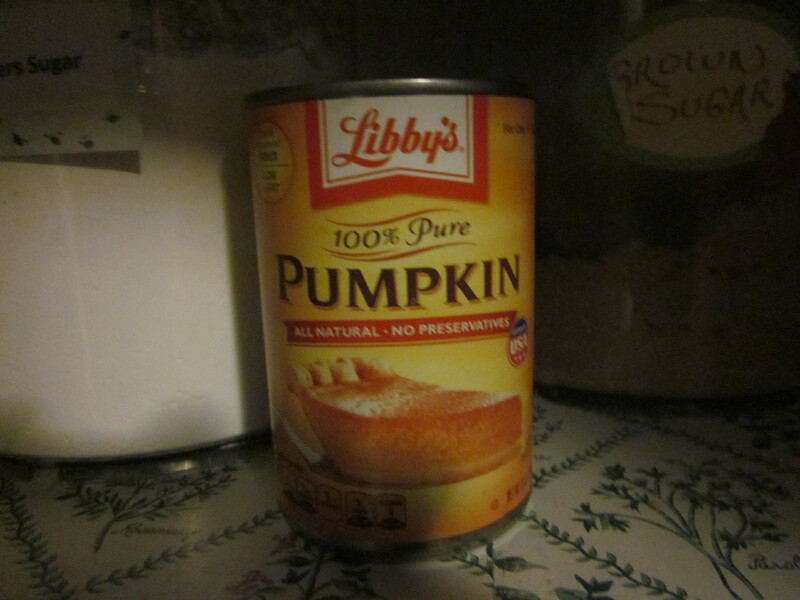 I opened the pantry door and rummaged around inside, searching for something to satisfy my craving. 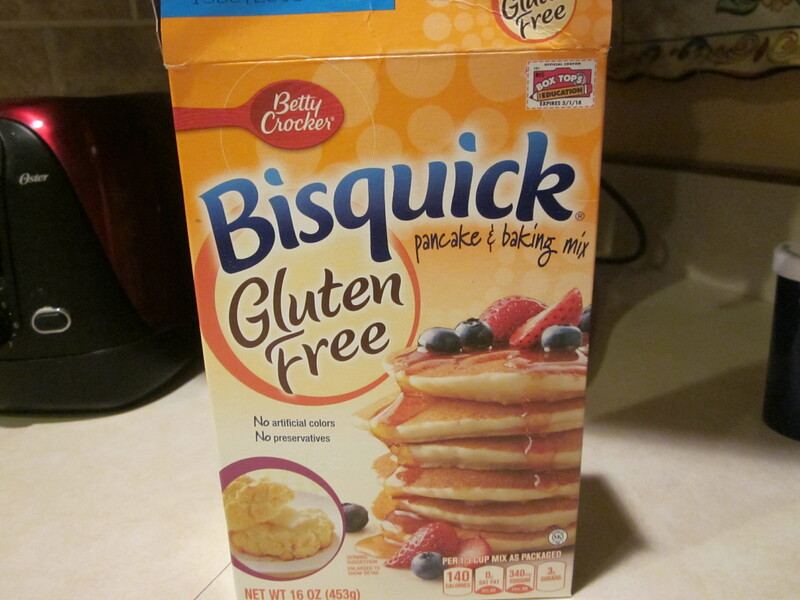 Then I spotted the box of Bisquick. They have a gluten-free version now in case you didn’t know. I could make biscuits. But that wouldn’t satisfy the sweetness I was looking for. Strawberry shortcake would do the trick. But alas, no strawberries. When my daughter heard the disappointment in my voice, she suggested that I use a bag of frozen mixed berries that was taking up space in the freezer instead. Great idea! I baked the biscuits according to the recipe right on the back of the box. The recipe said it would make 10 biscuits. 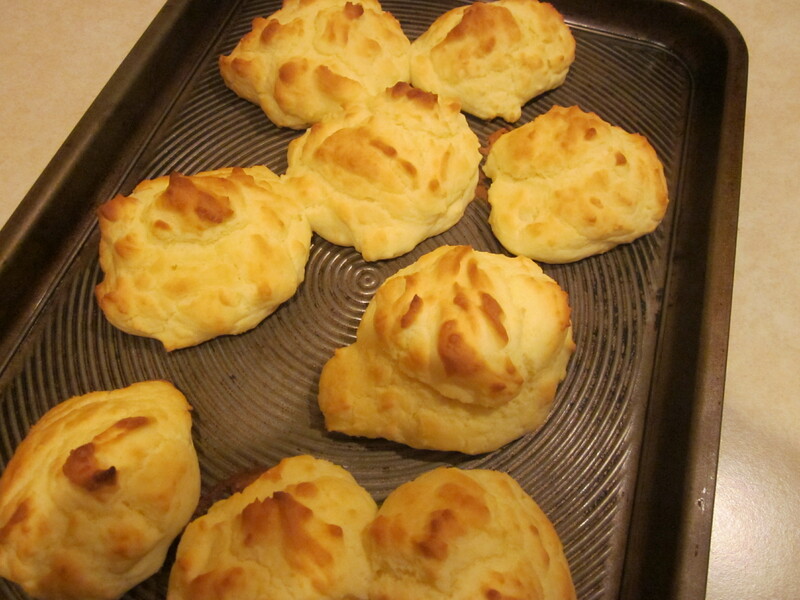 I decided to make them bigger and make only 9 biscuits. If I was going to make a sweet treat, I wanted more than a mouthful. After 15 minutes they were done. I took them out of the oven and let them cool. Every time I bake something, I always want to taste it first before I serve it to anyone else. So…. when they cooled I tried one. Delicious! The wonderful aroma wafted down the hall which brought my daughter to the kitchen asking if she could try one. “Sure, go ahead,” I said. 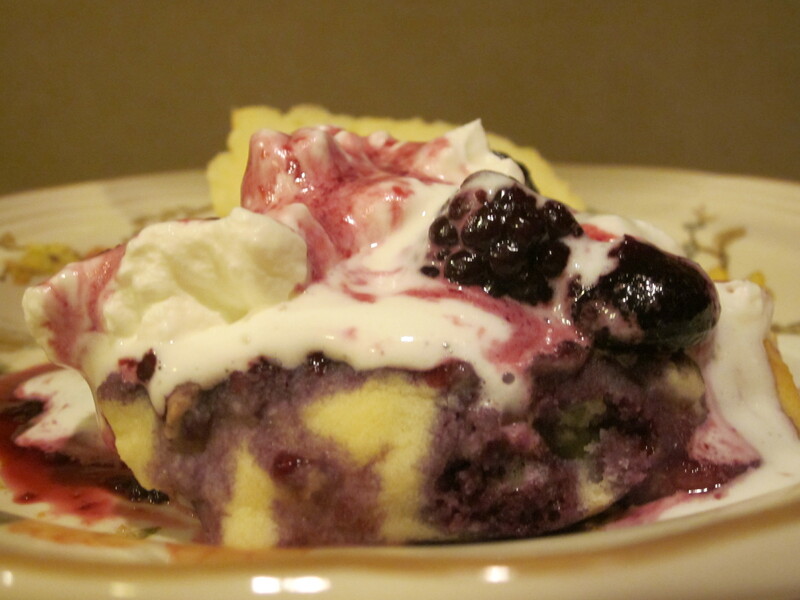 Noticing that I needed to start getting dinner prepared I decided we would have our mixed berry shortcake for dessert. 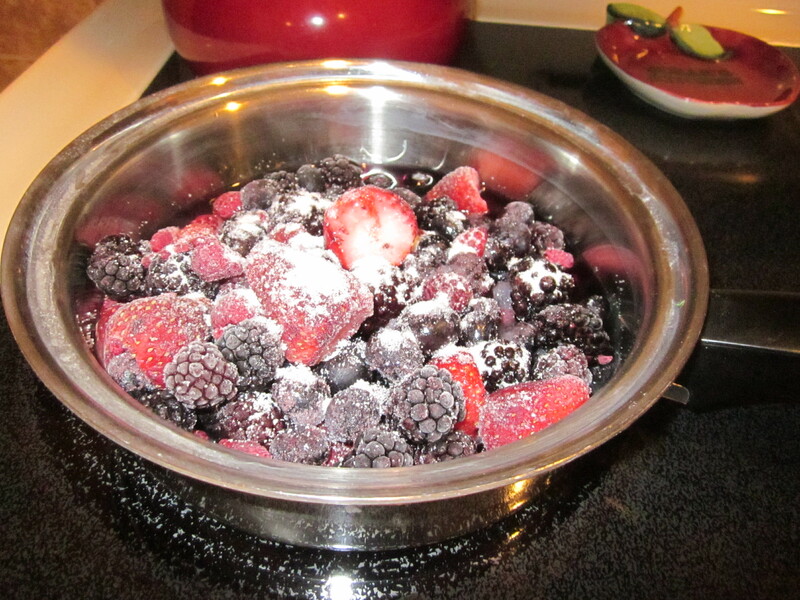 After dinner my daughter began to render down the frozen berries on the stovetop and added some sugar. 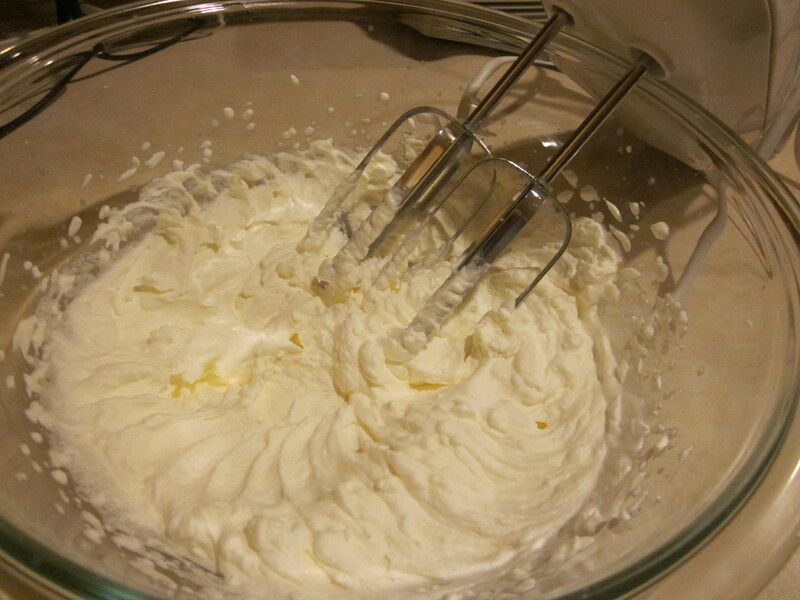 I set about whipping the cream. Once finished, I sliced up some biscuits, put the fruit mixture on top, added some whipped cream and topped it off with more of the hot fruit mixture. It was heavenly!!! My husband came in search of his before I even called him. I find myself doing this a lot lately. If I want a snack I end up baking something. I do more baking now than I’ve ever done. 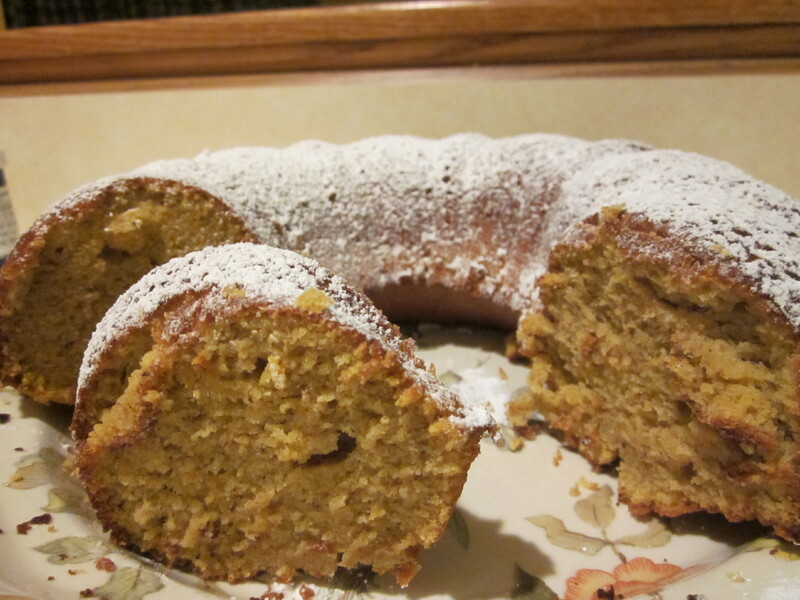 Have I mentioned that I’ve put on some poundage since I began my gluten-free baking adventure? 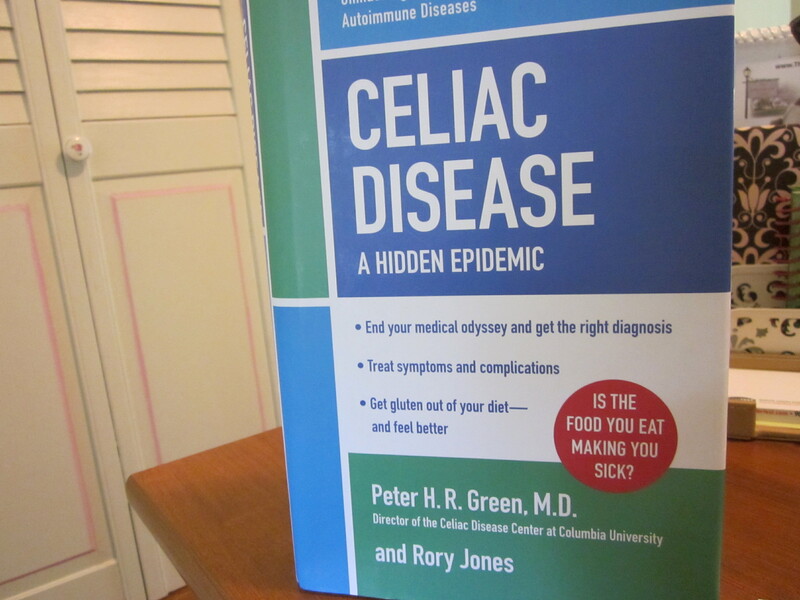 Some people are under the impression that if you are eating gluten free you will lose weight. Well that hasn’t happened to me. I love to bake and I love to eat it. Remember I mentioned that I lost a lot of weight due to the fact that I couldn’t keep food down for a year. After my first cancer surgery, my surgeon’s advice to me was GO HOME AND GAIN SOME WEIGHT. Well I heeded his words and did gain some but perhaps a little too much. Now my doctors are telling me the opposite, suggesting that I lose at least 10 pounds. That’s going to be mighty hard to do unless I give up baking. Yes… I’ll be the first to admit it. 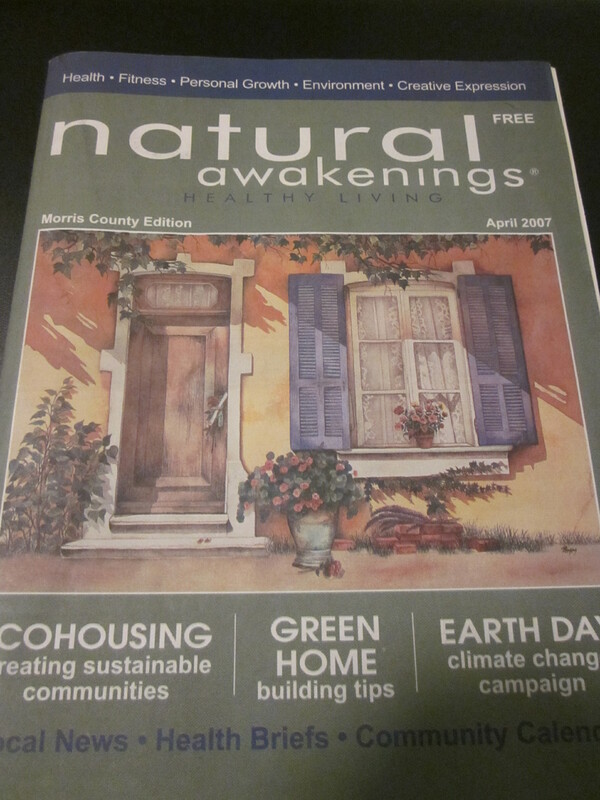 My health was deteriorating slowly beginning in 2003. Well, that’s when I first noticed it. In 2005 I was vomiting practically every day. I was so tired and weak I don’t know how I was able to hold down a full-time job. I’d throw up in the bathroom at work. No one knew it though. More times than I’d care to remember, I would pull my car over to the side of the road on my way to work or home and throw up. In the fall of 2005 my twins headed off to separate colleges. I was barely able to help them on each of their move in days. I couldn’t carry much because I didn’t have the strength. Making the trek from the car, across the campus, and up the stairs to their rooms was impossible for me to do. I had to keep stopping to take a rest. I was more of a hindrance than anything else. Finally, I sat in the dorm room and watched everyone else move stuff in. Here they were, my daughter in August and my son in September, so nervous about moving off to a different state, making new friends, and doing well in their studies. I didn’t want them to have to worry about me. In my mind I kept thinking that my family and friends didn’t know how sick I was. On the phone one night with my mother I told her that maybe I did have cancer and the doctors weren’t telling me. I realize that was a silly notion. Of course they would tell me. If they knew. Due to the constant vomiting, I lost 40 pounds. A woman I worked with asked me what my secret was for losing so much weight because she wanted to do it too. She had to be kidding. My clothes were just hanging off of me. I felt like hell and was desperately trying to keep food down. I decided to just eat soft things like, jello, pudding, soup, and scrambled eggs. Well, that didn’t help. I threw that up too. And most of it contained gluten. As I mentioned in a previous post, my hematologist ordered 8-week iron intravenous treatments for me several times during the year due to my severe anemia. One particular evening I had finished my eighth week of treatments but I wasn’t feeling any boost of energy at all from this last round. I was barely able to drive myself home. I would close my eyes at red lights to rest because I was always so, so tired. When I arrived home I literally crawled in to the living room and lay there. My husband was already home from work and preparing dinner in the kitchen. I announced from the floor that I was home. He looked down at me and asked if I was all right. No… I’m not kidding you. He really asked me that. You see – when people view you as a strong person they assume you never need help. I’ve been through some tough times in my life and managed to survive it all somehow. So, I picked myself up off the floor, told him how tired I was and plopped down in a kitchen chair. I really didn’t even want to eat because I already knew within half an hour I’d be throwing it all back up. When my kids came home from college for Thanksgiving break, I could tell by the looks on their faces when they saw me that I looked really bad. I was physically and emotionally drained. I’d like to end this post today on a happy note but I can’t. Things got much, much worse.